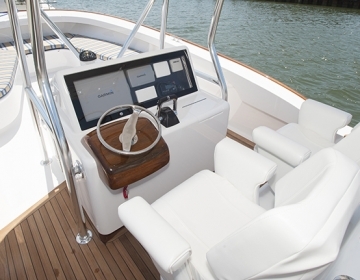 Originally built for 3-time Jarrett Bay owner Curtis Strange, this boat is a no-nonsense center console custom crafted for hard-core inshore and offshore versatility. 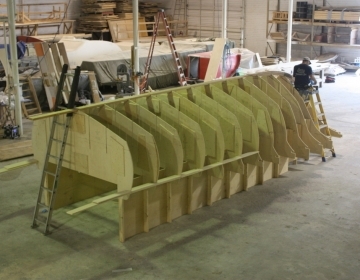 What can I say but this boat looks like it is being built for the Florida fishery. It should be very popular once it is introduced to the fishing public. The rendering looks great, in Jarrett Bay style and design. I can not wait to see further drawing of the interior and how it will be powered. Is there any plans on using the 560 H P outboard that is being built in the mid west? If so I will bet you that that would be a lethal combo. I hope JB will offer this boat with transom mounted engines as opposed to with a bracket or other extension. I just have never understood the value of these. Also, the better large center console boat manufacturers are now offering aft- facing seating which enables anglers to better keep an eye on their trolled baits. Finally, I’m hoping JB will come up with a creative way to facilitate more seating capability forward. This should be a great south Florida boat as the significant bow flare should provide a dry ride on those days with prevailing 10-15 knot S-SE’ly winds offshore, but also foster many inshore alternatives as well due to its hull form and draft. Good luck with this!!! Thanks for the feedback Rob (and Bob too). To be clear, this is not a production boat – this a one-off, cold-molded hull built to spec for the owner. Curtis will be getting exactly the features he wants, nothing he doesn’t. That’s not to say that your suggestions have any less merit, just illustrating that the design of this boat, as with all of our custom builds, are largely dictated by 1 person, not the market at large. Thanks very much for the clarification! Sorry Tony, we are not selling plans for any of our designs at this time. We would love to talk about your ideas and possibly building a boat for you though. Please let us know if we can answer any questions! I would love to own one of the 32 CC’s. What is the base price? Keep up the good work. Hi Michael, a sales representative should be in touch shortly via email – thanks for your inquiry! Please emai me a basic price and timeframe for a build. Thanks for your interest Shane, Tate will be in touch directly. I wish I could get Randy to build one for Marlin Magazine! Randy says we can work a trade, Dave! Would like to talk about design. Please email me. Awesome design btw! Thanks for your inquiry Cody – Tate will be in touch with you directly. Inquiring about price point and build for the Miss Sarah. Thanks for your inquiry, we’ll be in contact with you directly via email with more information! It appears that the stringers on Miss Sarah are very tall and constructed of plywood. I am sure it would be marine grade plywood, but is this the new cutting edge type of construction Jarrett Bay is using. I did not see any other of your boats with this feature. Just curious? Hi Randy, on a small boat such as this, our egg crating acts like a stringer. The egg crating is basically the grid-like framework that gives us our deck height, creates little bilge compartments, etc. – basically we’re able to kill two birds with one stone on a boat this size. They are constructed of two layers of 3/4” marine grade fir plywood. Would like more info on a 32′ centre console pls. The boats look absolutely beautiful. Really nice. Captures classic lines and presents them in a new and interesting way. Very impressed. The 72 is off the charts. Keep up the good work. The lines and detail on this boat are spectacular. Would you consider a ~38′ CC with seven marine 557s? 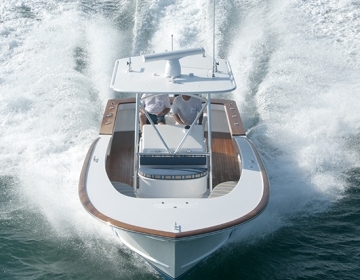 Have been looking at Intrepid, but would much, much rather consider a JB – looking for a good Bahamas / Keys boat. Perhaps a mix of this boat and the 46 walkaround that appears to be under construction currently – with two or three 557s? Hi Greg, we’d love to talk to you about the possibilities and will reach out to you via email to answer your questions! thank you for the kind words – we appreciate it!